BISMILLAH Assalam o alaikum Jawed bhai, with apologies, for giving a late feedback. First, his death is reminder for all of us about the the temporal existence we have in this place and the fact that we all have to return back to our CREATOR one day. 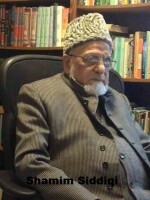 Additionally, i do like to mention that back in the days when i was learning about Islam, dawah and its process, shamim uncle was the one who inspired me to read about current affairs, news, edotorials, etc. and afterwards to examine them from an islamic perspective, an exercise that i initially struggled with only to later find the fruits it contained. Moreover, when i look back at the time we spent in his company, i cannot but admire the politeness he always show mash'ALLAH, in group or one on one discussions, even if the discussion was heated. May ALLAH(SWT) forgive his sins and reward him immensely for his good deeds and positive contributions.